It's been quite a long time since I last went to the pawn shop. Actually, according to my blog, it was September 22nd, and I had trouble finding any horror movies to spend my money on. 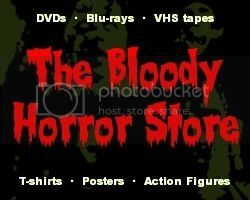 I think people just aren't buying as many horror DVDs as before despite Wal-mart's Hallowe'en endcaps or Dollar General's fine selection of Echo Bridge multipacks. Most of the bargain titles are a load of crap, and Wal-mart's $5 bin is always so overloaded that it's irritating to rummage through without grabbing a shopping cart to heave all the westerns and lame teenage comedies into. Contrary to what some sites would have you believe, Blu-ray has made absolutely no difference to DVD sales. I've asked the managers of various stores and it seems that people aren't buying much on the HD format either. I blame Netflix, Vudu, Hulu, and YouTube. There probably won't be any DVDs produced in a few years' time due to all this streaming. I'm not sure how I feel about that. As much as I like having a physical copy of my movies, if I wasn't blogging about them then I highly doubt that I'd ever rewatch 99% of them again. Anyway, before I end up writing an article about how collecting movies is dying out or start ranting about how my favourite pawn shops aren't even carrying VHS anymore, I'll tell you about my latest purchases. The first DVD I picked out was "Dark Ride" from the original 2006 Afterdark Horrorfest. For some reason, this was the only one which I didn't watch when it came out so I have no idea if it's any good or not. It still had its cardboard slipcase with a Wal-mart sticker on it (impossible to remove without wrecking it) and the insert which lists all the other Afterdark Horrorfest movies. Sometimes, in moments of madness, I want to collect all the Afterdark Horrorfest DVDs even though I know that they range from mediocre to appalling. I wouldn't have any problem there as they keep on turning up in the pawn shops, but I just can't bring myself to do it. I still have a couple on the Afterdark Horrorfest III 8 pack which I haven't managed to get through, and I gave up on the final Horrorfest after "Lake Mungo". Life is too short for bad movies. My second purchase was "The Faculty" and "Phantoms" double feature which I've picked up and put back again several times before. I've already seen both films, but I only like "Phantoms". "The Faculty" is just too much of "trendy teen horror" for my taste. "Halloween 4: The Return of Michael Myers" is a replacement for my VHS copy which I enjoyed watching again fairly recently. I could have got this as a double feature DVD with "Halloween 5" for $2 more, but I hate the latter too much to even buy it for completeness. 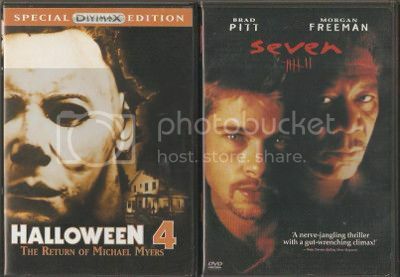 Finally, to complete the "4 for $10" deal, I got a still sealed copy of "Se7en" (or "Seven" if you don't like the stupid way the IMDb lists it). I can barely remember a thing about it apart from the torture scenes having most of their punches pulled for the R-rating so I'm hardly in any hurry to watch it again. I just thought that I'd better have it because it was there. In other news, the 7/11 which replaced my local Wilson Farms has won me over with its selection of fine dining. I was quite depressed when Wilson Farms was replaced because it meant my source of "2 for $3" pizza slices had come to an end. Fortunately, the 7/11 is now doing $1 pizza slices (which are admittedly a little bit smaller so I have to get three of them each time) so I have nothing to moan about now. Their hot taco things which look like a crunchy hotdog have also become a nice treat. I've yet to buy one of their "cheeseburger rollerbites" because I ate far too many of those when I was selling them in my restaurant five years ago. Maybe I'll get one later today. As you can see by the new daily tabs on the menu at the top of this blog, things are going to change on here next week with more articles themed to each day rather than individual movie reviews. I'm still going to be reviewing but in a slightly different way. With only 80 movies left in "The Vault" to rewatch and write about, I'd end up with a dead blog (and bored out of my mind) in a couple of months so, hopefully, I can resuscitate things even though everyone is burnt out after Hallowe'en. How do you feel about the horror genre right now? Is it completely dead? Are you buying as many DVDs as you used to? Are you bored with mediocre movies? Is horror blogging as dead as a dodo now too? Let me know in the comments section below.